SONNYS QUILT: This acrylic on canvas (appliqued, printed, and pieced fabric) from 1986, Faith Ringgolds tribute to her childhood friend Sonny Rollins, can be seen in Declaration of Independence: 50 Years of Art by Faith Ringgold, which will be on display in New Brunswicks Mason Gross Galleries, Civic Square, 33 Livingston Avenue, through June 26. Hours are noon to 4 p.m., Thursdays through Sundays, and by appointment. The exhibition was curated by Judith Brodsky and Ferris Olin, directors of Rutgers Institute for Women and Art. Ringgold and Rollins, who both received honorary doctorates last month at Rutgers, go way back. In We Flew Over the Bridge: The Memoirs of Faith Ringgold (Little Brown 1995), the author reveals that she and Sonny, ages 12 and 13, once shared a kiss during a game of Post Office. When they were growing up in Harlem’s Sugar Hill, he used to come by with his saxophone and “once or twice” she sang while he played. 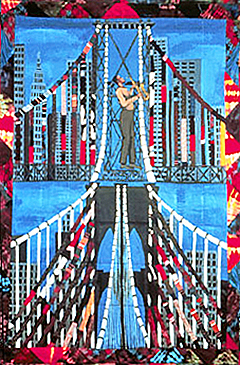 Among the many pleasures in “Declaration of Independence” is Sonny’s Quilt, which shows the tenor colossus standing tall in an immense maypole of a bridge trailing cables like gaudy streamers. There’s also an acrylic on paper of the venerable tenor man 40 years down the road (Sonny Blows) in Jazz Stories, a series of nightclub images that practically jumps off the wall at you. I wish the amazing Mama Can Sing, another acrylic on paper from the same period, could be blown up and plastered on a giant neon billboard in front of the Mason Gross so that passersby might be tempted inside to feast their eyes. The sad truth is that on a Saturday afternoon in June such inspired and inspiring work — free and open to the public — was lighting up a virtually empty gallery. If “Declaration of Independence” has a patron saint, it’s President Barack Obama. Had it been mounted a year ago under the same title, it would have been like a novel bereft of a denouement. The words and images in the first room with its bloody American flag (“The Flag is Bleeding,” oil on canvas, 1967, one of the artist’s first major works) and vividly documented betrayals of the words of the original Declaration (the last image juxtaposing Jefferson at his desk with Martin Luther King in a jail cell) would have seemed politically dated. Instead, the artist is able to dedicate these “illustrations” to “the American People” who elected “our first black president.” A similar plotline is played out in the various galleries, the message writ large when you come to Ringgold’s portrait of the smiling 44th president (“Yes We Did”) dated 4/20/09 with the artist’s handwritten reference to “the power of the American Dream” manifested when “nearly 70 million Americans voted the Dream and the Dreamer into the White House.” The show’s closing act is a series of panels illustrating Ringgold’s latest project, a limited edition of playing cards with the theme “Yes I Can,” a pack of which can be bought at the exhibition (or won if you sign up for a lottery). “My ties to Rutgers go back many years,” Ringgold says. “I think it’s been a mutually gratifying relationship. They gave me my very first retrospective, covering the years from 1963 to 1973, and it was just absolutely wonderful. I’ve made a lot of friends at Rutgers.” That exhibition took place at the Rutgers University Art Gallery, now the Jane Voorhees Zimmerli Art Museum. Since then she has appeared numerous times on campus, giving lectures and meeting with students. She also created two print editions at Rutgers’ Brodsky Center for Innovative Editions. Recent work includes Our Ancestors, which Ringgold describes as stories about the world’s children “who faced with life in a world at war have forgotten how to play. We call upon our ancestors who would surely bring love and happiness into their lives? Where would we have been without them?” In 2007 she completed a series of eight serigraphs for the publication of Martin Luther King’s Letter From Birmingham City Jail.